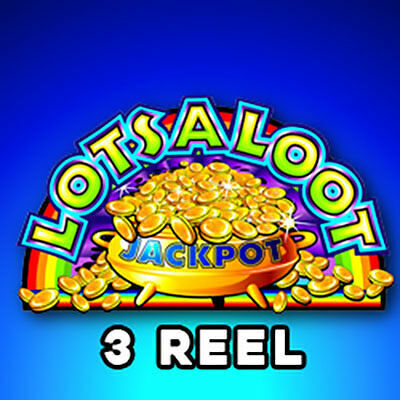 Get ready for a nostalgic journey back to when fruit slots were at their peak with the Lotsaloot 3 reel slot game by Microgaming. They’ve turned back time and gone totally retro, something that people are really starting to appreciate more with the crazy and amazing modern world we live in. Microgaming say they make games that are meant to be played, and instead of this being a blindingly obvious statement, they mean it in the sense that they create a fully immersive experience for the players. They pull them into a story, or a feeling, or wow them with some high-quality animations that make them forget where they are for a moment. If you’re a fan of the old-school vibes like Lotsaloot then play their games Cash Clams or Retro Reels. This is a no-frills slot game, exactly how it was originally intended, for a truly authentic gaming experience. You’ve got 3 reels and 3 rows, with the paytable and the progressive jackpot surrounding them. It’s designed just like an old slot, with the classic bar symbols and 7’s. The highest value symbol is the Lotsaloot symbol, if you land 3 of those you’ll get 2,500x your bet, followed by the 7, which gives you 80x your bet if you land 3 of them. Wild symbol – you do get a wild in this slot game, and it’s in the form of the Lotsaloot logo, which substitutes for all other symbols on the reels to form a winning payline, but it also gives the player a multiplier. So if you land a single wild symbol on a winning line, your cash prize is doubled, if you land 2 wild symbols then your payout is multiplied by 4 and so on. Progressive jackpot – you need to play all five paylines for the progressive jackpot to be accessed, and in order to do this you need to bet all 5 coins. Plus you need to land 3 wild symbols on the fifth payline. Lotsaloot is definitely a game for those who are looking to go back to basics, and play a game that gives them the authentic slot experience. The retro look and feel is great, and the wild symbol can get you some great wins, even for a reel set that’s so small. The progressive jackpot adds in another element to the game to make it more interesting as well. An enjoyable, straight forward game that everyone can play.